The Ceará and Potiguar Basins on the equatorial margin of Brazil are two deepwater underexplored basins. Both have geological exploration successes, indicating working petroleum systems and potential deepwater reservoirs. PGS has undertaken an extensive series of broadband multi-sensor GeoStreamer 3D surveys to address exploration concerns and de-risk play elements in the Potiguar and Ceará Basins. In 2015, the company acquired the Ceará Fortaleza survey, followed by Potiguar Aquiraz in 2016 and Potiguar Aracati in 2017, covering over 18,000 km2 in total. Potiguar Touros is currently being permitted and is scheduled for acquisition in 2019. Several major E&P companies, including Petrobras, BP and Devon, have investigated the potential on the equatorial margin in recent years. Pecem and Pitu, discovered by Petrobras in the Ceará and Potiguar Basins respectively, are the two deepwater discoveries that have given life to the exploration programs of subsequent leaseholders like Total, Wintershall and Shell. 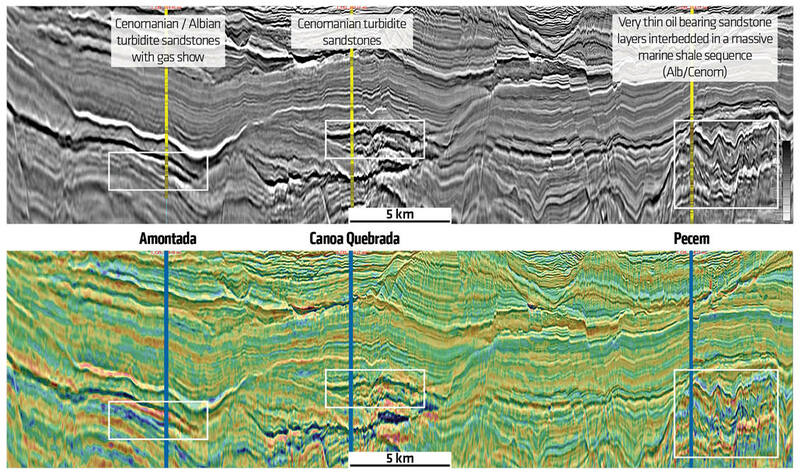 Figure 1: This Ceará Fortaleza dip seismic section demonstrates some of the significant surfaces in the area of the Pecem discovery well. Premier has a proposed location to the south-west of the Pecem well called the Pecem Crest. Rotated fault blocks in the rift section are overlain by Cretaceous syn-rift sediments. There is an interval of additional sedimentation prior to Tertiary erosional events as well as volcanic intrusions. PGS GeoStreamer 3D datasets are positioned to give explorers in Ceará and Potiguar the best opportunity to de-risk these play fairways and prospects. Significant shallow water discoveries have been made in both the Ceará and Potiguar Basins, while the largest oil-producing region in Equatorial Brazil is the onshore portion of the Potiguar Basin, where production is from the syn-rift to transitional successions. However, only a few deepwater exploration wells have been drilled in the Equatorial Margin from the Amazonas Cone to the Potiguar Basin. Figure 2: This Ceará Fortaleza strike seismic line runs from the Romanche Fracture Zone in the north-west to the Pecem High in the southeast. The syn-rift section is overlain by compression associated with the fracture zone. Tertiary erosion, mass-wasting events and canyons are evident in the shallow section and sea floor. Data source: PGS. The offshore plays are structural and stratigraphic traps in the Upper Cretaceous reservoir section. Tests of these reservoirs along the conjugate margin in West Africa have precipitated a move by explorers to examine the Equatorial Margin from Brazil to Guyana from a new perspective. Zaedyus in French Guiana was an early geologic success and Liza and associated prospects in Guyana have become the poster child for economic success in these play fairways on the South America Equatorial Margin. The dip seismic line in the foldout (Figure 1) shows rotated fault blocks in the rift section, overlain by Cretaceous syn-rift sediments, which in turn transition to post-rift turbidite onlap facies. There is an interval of additional sedimentation prior to Tertiary erosional events as well as volcanic intrusions. In the strike direction (Figure 2), there is a highly faulted and folded zone associated with the Romanche Fracture Zone to the north-west. Figure 3: Frequency decomposition cube looking south-west towards the coast. Channel/canyon systems feed downdip to deepwater fan and channel systems. Data source: PGS. Spectral decomposition is a useful tool for showing geomorphology and depositional system components on high quality seismic data. Figure 3 shows some of the details of a channel system as it meanders down dip to the basin floor. The late Cretaceous reservoir play fairway has been penetrated by the Pitu and Pecem wells. The Pitu well in the Potiguar Basin found oil, gas and condensate at depths of 4,150m to 4,450m in Upper Aptian sands in the Pescada Formation. The discovery well was spudded in 2013 in 1,731m of water, 55 km offshore Brazil’s Rio Grande do Norte and the prospect is still considered to be in appraisal. It reached a total depth of 5,353m and discovered a 188m column of intermediate 24° API gravity oil. The Pecem well in the Ceará Basin (Mundau Subbasin), 76 km offshore from the county of Paracuru, spudded in 2012 in a water depth of 2,129m and found a hydrocarbon column estimated to be 290m. The oil-bearing sands are Aptian age in the Paracuru Formation. The oil discovered in this well indicates a transitional environment source but could also include a contribution from the same Albian-Cenomanian source rock system present in the equatorial margin of West Africa. The dip seismic line through the Pecem well location (Figure 1) illustrates the Pecem High and onlapping intervals above it. The deepwater seals for both the Ceará and Potiguar Basins are regional shales from the Cretaceous to the Tertiary. Mass-wasting events in the Upper Tertiary could cause seal failure for younger stratigraphic intervals. PGS GeoStreamer 3D data improves attribute computations and reduces risk with more precise reservoir estimates than conventional streamer data. An arbitrary well tie line (Figure 4) shows the Amontada, Canoa Quebrada and Pecem wells. The Albian/Cenomanian section contains turbidite fan/channel systems penetrated by the wells and illustrated on the full stack and Vp/Vs seismic data. Figure 4: An arbitrary well tie line through the Amontada, Canoa Quebrada and Pecem wells. The upper display is a -90 degree phase rotation of the full stack and the lower display is a rotated full stack with a relative Vp/Vs overlay. The Vp/Vs display of the reservoir facies in the lower image highlights turbidite fan/channel deposition. Data source: PGS. The Equatorial Margin of Brazil has four potential sources for exploration prospects and play fairways. The oldest source system in the Aptian/Barremian is characterized by highly cracked, very mature oils and condensates sourced by a saline to alkaline, calcareous black shale deposited in a lacustrine brackish to saline anoxic environment. This petroleum system sources the majority of current production offshore Brazil. The second oil system is characterized by transitional environments, as found in the Ceará and Potiguar Basins, with the Late Aptian source rocks in the early to peak oil window stage. Most of the Equatorial Brazilian continental margin basins have little salt in the transition from continental to marine environments. The Ceará Basin may be the exception, as a few boreholes encountered evaporites in the Late Aptian stratigraphic interval, indicating a restricted depositional environment. 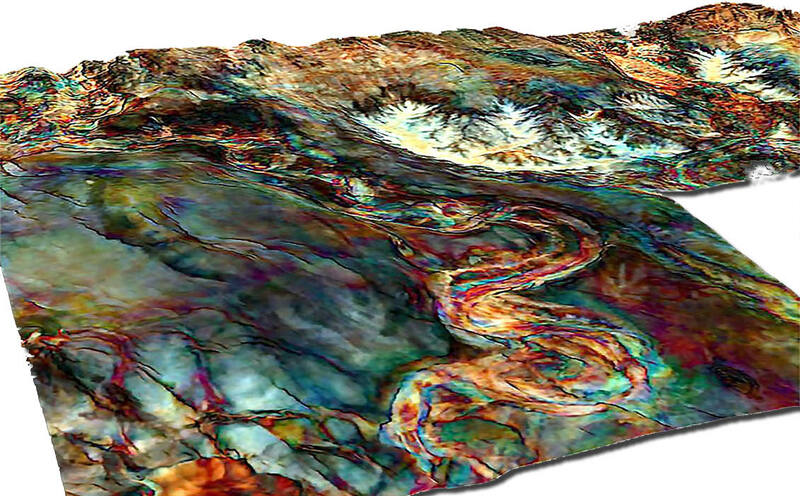 Geochemical data from hydrocarbons recovered from oil fields in the Ceará and Potiguar Basins in northern Brazil indicate the presence of oil types similar to the ones that are present in the salt basins south of the equatorial transform fault zones. Consequently, the transform margin basins may share similar source rock systems. The third petroleum source consists of Albian/Cenomanian/Turonian marine black shales, which are a major source for the oils in the West African salt basins. Similar oils have also been recovered in the Amazonas Cone and Pará-Maranhão Basins and in five ultra-deepwater discoveries in the Sergipe Basin. The origin of the marine hydrocarbons in these systems is related to Late Cretaceous global Oceanic Anoxic Events, which occurred when the two plates were totally separated and the basins were influenced by worldwide sea level rises and falls. The fourth source system consists of Tertiary source rocks deposited in deltaic environments in the Pará-Maranhão Basin. The 1-PAS-9 and 1-PAS-11 sub-commercial discoveries, as well as the gas accumulations in a number of wells drilled in past decades, were sourced by these Tertiary source systems. The current play fairways, demonstrated by recent drilling and seismic stratigraphy combined with seismic attributes from high quality GeoStreamer data, are generally underexplored on the Brazilian Equatorial Margin. 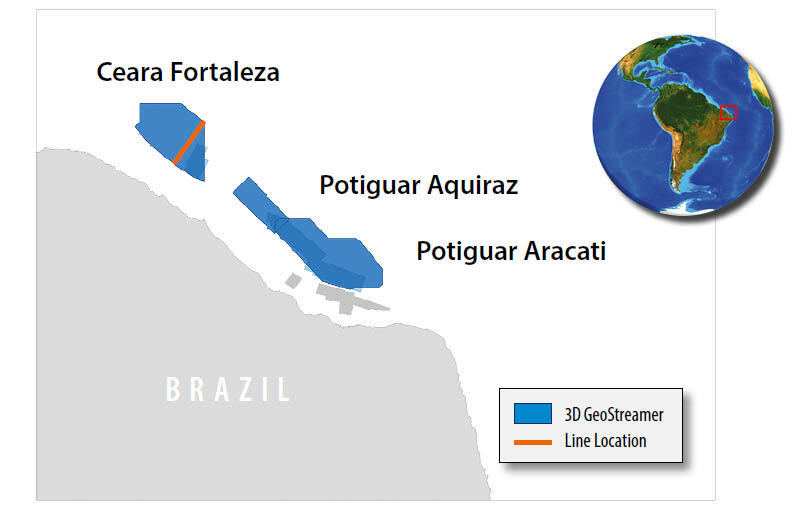 Since 2015 PGS has undertaken an extensive series of GeoStreamer 3D surveys to address exploration concerns and de-risk play elements in the Potiguar and Ceará Basins. Future exploration using these excellent 3D seismic datasets should lead to continued successes for the oil and gas industry in Brazil. Promising deepwater hydrocarbon find on the Guanxuma prospect in the Santos Basin, Brazil. A beautiful country, flanked by mountain ranges and famous for fine wine – but Georgia’s primary contribution to the hydrocarbon industry is as a corridor for oil and gas travelling from the Caspian to European markets. Or so it was thought - until modern seismic techniques and recent exploration revealed oil bearing structures in the sub-thrust zone, only poorly imaged on the older Soviet era data.